LG has unveiled the Bluetooth MiniBeam project ahead of its IFA debut next month. The mini-projector is the latest in a line of every shrinking projectors to hit the market in recent months. Measuring 17.2cm x 11.7cm x 4cm, it isn't the smallest projector to hit shelves in recent months, but it is still small enough to fling in your bag or brief case. So what's the point of the LG Bluetooth MiniBeam then? Well, unlike its smaller rivals, it can project images measuring from 25 inches to 100 inches. By comparison, its smaller rivals can only really manage up to 60 inches. 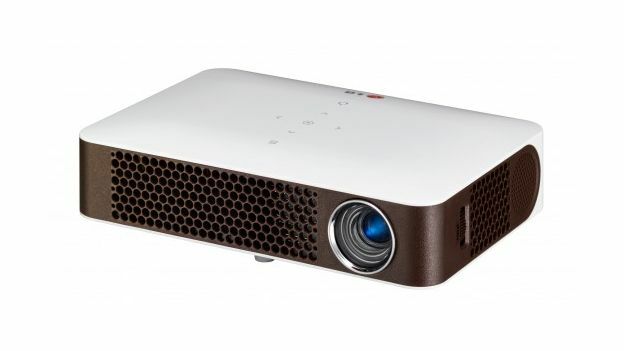 Thanks to its LED light source, LG's new mini projector has a brightness of 700 lumens, a 100,000:1 contrast ratio and a resolution of 1,280 x 800. Hardly something you're going to want to have as your main screen but perfect for on the go gaming or showing your laptop screen to an audience. It also offers a number of connectivity options, including USB, HDMI, RGB, Component and AV. It also has the ability to stream audio to a Bluetooth speaker. But don't worry if you don't have one – or forget it – because the LG Bluetooth MiniBean comes with two 1W speakers built in. The Bluetooth MiniBeam will be getting shown off at IFA in Berlin next month. We're expecting LG to announce pricing and availability then, but we've been told to expect it to land in European markets from September.